There are many ways to find material for public domain materials and there are many ways to use public domain materials. 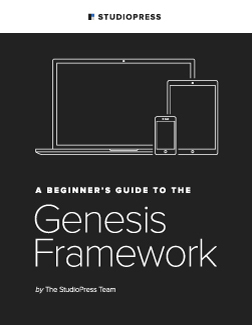 The subject is endless and you could spend a lifetime studying public domain material and a lifetime marketing and using public domain content to make a good living. The basics of public domain are standard and a quick google search will bring up information that will help you determine what material is in public domain and what isn’t. Of course you could pick up the book The Public Domain Advantage for the price of 2 gallons of gasoline and have the information regarding public domain law at your fingertips. There is one marketer that I really trust when it comes to products and services. He’s very good when it comes to ebay and public domain research. In fact he released a video, free of charge, that gives you a quick view of how to use ebay to dig up hidden niches of public domain content. Check out his video below, I promise you’ll be pleasantly surprised with this free gift. You can use the information he reveals in this video to create your own product using public domain information…..of course he offers a complete set of videos and ebooks on how to use public domain material to create products, I highly recommend it if you are either in public domain or contemplating using public domain material for creating products to sell online or offline. I honestly would not have spend the time to put together the previous posts about CraigsAgent if I would have known that it was going to be shut down. I put a lot of effort in writing those posts, but in the long run, Craigs-Agent will maintain it’s exclusivity for a long time! Why??????? Believe me it’s not a marketing ploy. There was a change with the Ebay Affiliate program and the owners stopped selling the application to make the necessary fixes and then they decided to open up sales for only a few more days ….then lock it up, no more sales. I’m glad they decided to close down CraigsAgent, because it will preserve the integrity of the script and maintain it’s effectiveness. This will enable you to make money with Craigslist and make money with Ebay’s Affiliate program. If you’re still on the fence, that’s OK. I know what it’s like to have to balance a budget with wise purchases. Better not sit too long though, remember April 6th and CraigsAgent is gone! I’m going to be 100% honest with you. It’s time for some honesty in the Internet Marketing world. Ready? If you were expecting me to blow the lid off of it’s faults you might be surprised that that is my statement of truth. I’m proud to say that it is! The software designers worked tirelessly to make sure this is the very best automated income generator in the world. It’s been tested and tweaked in beta mode until they were 100% sure it was ready for you. It most definitely is, and the response was, is and has been overwhelming. Customers on Craiglist are pleading with someone to show them where to find a product they need. They either don’t have the time or inclination to find it themselves. You can come to their rescue! You need CraigsAgent. It will take you ten seconds to send them an e-mail with your cloaked affiliate link. Imagine the recipient’s surprise when the very product they’ve been searching for is sitting right in their inbox? I’ve read testimony after testimony with people explaining that they’ve actually gotten emails from those people “Thanking Them” for sending them the info they were looking for…..Just think, it was done automatically by CraigsAgent! You helped someone find what they were looking for….you didn’t spam anyone and you made a couple bucks for your effort and made someones life a little better. So, you can see why CraigsAgent is the talk of the town. There really has never been anything like it and never will be after April 6th. Take advantage of the lifetime support, free upgrades, unlocked software, quick setup guide, and built-in link cloaking technology. Oh yeah, there is a very generous money back guarantee as well. I hate to keep reminding you of this, but there is a limited supply and all sales stop at April 6th, 2008. They WILL pull this product, Craigs Agent from the market to maintain its exclusivity. Buy yours now if you want to be one of the few people on the planet to benefit from such a fun and easy income generator. One of my son’s friends was bidding on Ebay and extremely disappointed when losing a bid. I showed my son how to use ebay sniper software so he asked me to share some ebay snipe tools with his friend. This is the email I sent. 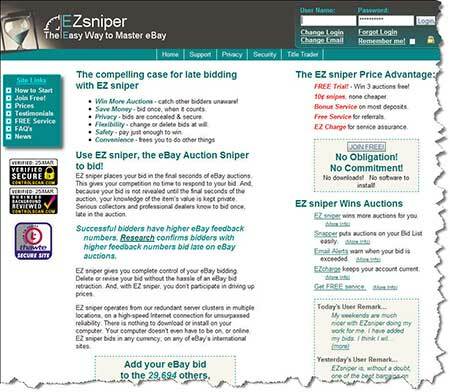 Here’s a link to Ezsniper which is ebay sniper software….its a program that automatically bids at the last minute or seconds of an ebay bid. The only way you can get beat is if someone else is using this or a similar program…..even then you have a much better chance of winning the bid. You can read about how ebay sniper software works, but I’ll give you a quick idea. Let’s say you want to bid on a chainsaw and you’re willing to spend $300 on it and no more. So, you set up ezsniper and but $300 for the maximum bid. Keep in mind that doesn’t mean you’ll always spend the $300. If the bid is going along and the last guy bids $150, ezsniper will automatically bid $155 seconds before it closes and you’ll win the bid. Conversely, if someone bids over $300, ezsniper won’t bid on it anymore since you put a maximum bid of $300. The cool thing about this software is that you can set the maximum bid when the item first comes up on Ebay and sit back and wait…..or if you decide you really want it and you see that the bid is over $300 you can go back into the software and increase your maximum bid…..of course you can’t do that in the last seconds. I think this ebay sniper software will give you get 3 free snipes and then it costs 10 cents a snipe or something like that……It really works though, I’ve used it to get parts for Michael and a couple of auctions for myself. Almost forgot, when looking for ebay sniper software, you’ll find plenty of free ebay snipe tools but beware because they don’t work as well as Ezsniper…as often said, you get what you pay for! What would happen if you could combine Craigslist with Ebay? How about automatically providing Craigslist searches with Ebay Products, giving you commmsions for ebay sales and ebay sign ups. Takes the best of 2 worlds Craigslist autoposting with ebay affiliate sales …… all white hat! Oh ya, don’t worry about ebays new affiliate program and the ebay affiliate program changes. This software and script will still work with Ebay’s new affiliate program. You won’t be able to buy CraigsAgent after April 5th 2008 …..and that’s no BS. It’s really too bad because this is one of the most effective working scripts I’ve been exposed to and it sells itself. Thus the reason it really is being taken off the market. It works too well and the creator is afraid of too many people using it. If you’re lucky enough to read this before April 5th, you better jump on CraigsAgent now! Understand….affiliate marketing can be really tough and it’s difficult to become successful. I Near threw in the towel till I stumbled upon Craigslist. There’s a entire division committed to items folks need and can’t find. Then it hit me! I could become an broker of sorts. I decided to take it upon myself to match the customer to their merchandise easily. I began e-mailing the authors of these want ads with an eBay hyperlink to the precise product they were searching for (with my affiliate hyperlink in them naturally). I was actually shoveling in a lot of serious money, however it made up really tedious work. That’s when I found out about a brand-new software package known as CraigsAgent. This amply automatizes the technique (since, it calls for 10 seconds to execute). This automation stands for effortless income for me and you! The purchasers on Craigslist are virtually praying for your assistance. It will require you 10 seconds to advertise an individual high-ticket product to a focused buyer (think how many sales e-mails you might mail out in ten minutes, half-hour, 2 hours)!! Rather than taking all day to do you might be finished in moments. Rather than being committed to your computer you will become able to savor your acquaintances and family. The money will equal the same, however the quantity of spare time you’ll have will sky rocket! This represents a real work at home business in a box that is ideal for seasoned and brand-new marketers likewise. This is a full package, you even will receive free lifetime customer support, free upgrades, unlocked software system, a quick start up manual, and link masking script (You pay zero for these when other people ante up big $$). Why wait for your own piece of a great automated income. Don’t wait since every minute blown is like throwing cash out the window. Do yourself a favor and check out CraigsAgent Now! James J Jones is one of those internet marketers I like to keep an eye on. His advice, suggestions and products are always highly regarded. Although he is an internet marketer, he specializes in Ebay. He has a blog….hasn’t been too active but you can sign up to his list. He doesn’t mail too often and when he does, it’s usually worth reading. I found a link to an entire set of screen capture videos on Ebay Training. Check em out along with his blog….highly recommended.